2007 American Tug 41 With many custom additions, "Blue Jacket" a 2007 American Tug 41 trawler, has confirmed herpedigree after arriving on the East Coast from her manufacturer in the Pacific Northwest. Shebegan duty between her home ports of Hobe Sound, FL and Chesapeake Bay waters. Thesemi-displacement hull proved her worth in most sea conditions. She has only 450 originalhours on a single Cummins QSC 8.3L common rail diesel engine rated at 540php. Cruises at 8kts burning 3.5 GPH and, when asked, her hull will plane and top out at between 16-18kts atWOT. She's equipped with both bow and stern thrusters to assist in close quarter maneuveringand a collapsible radar arch allowing passage under low bridges. A 10' Mercury RIB tender withMercury 15hp 4-S engine is included as well. Interior spaces are roomy and well appointed including a 2 stateroom 2 head layout withbeautiful wood interior and joinery. The master stateroom is located amidships and features aqueen size bed as well as ensuite head with enclosed shower. The guest stateroom is forwardwith a queen size bed to PORT and head & shower to STBD. The salon offers seating whichcan be converted to a bed and includes a custom Stressless Chair w/ottoman and Boyle hi-lowtable. Blue Jacket features an 8kW Northern Lights diesel generator (401 hrs.) as well as inverter withsolar panel auxiliary charger allowing you to run appliances while under way or on the hook.Her owners are most impressed with the stability while underway and the superior quality ofconstruction. Please review the specifications for all her many attributes. Berthed at herSummer dock off of Chesapeake Bay where she anxiously awaits the adventures of her nextowner(s,) she can be seen by appointment, so please call today to see this special listing. 2006 American Tug 41 AMERICAN TUG After seeing this vessel you won't believe the condition for the year on this vessel. The combination of very caring owners and northern fresh water cruising results in a boat that shows beautifully. SHE WAS JUST WAXED, NEW STERN AND BOW THRUSTERS, ALL NEW BATTERIES. NEW BOTTOM JOB AND NEW CARPET THRU OUT AS OF 6/1/2015. She is ready for the next owner to start cruising. If you have not been on an American Tug 41 you will be amazed at the space this vessel offers. 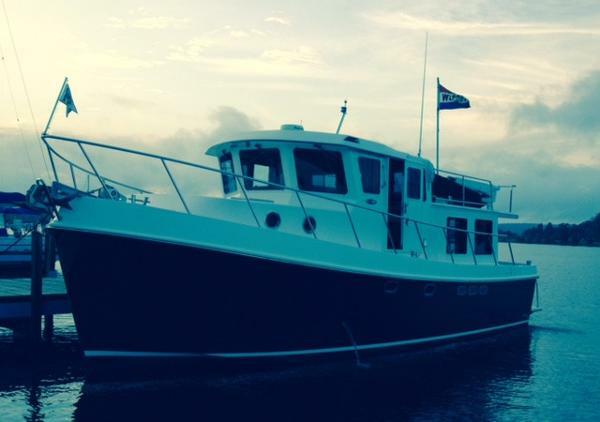 This may be the perfect loop boat for a cruising couple. The semi-displacement hull and low draft will let you cover more miles in less time than the slow trawler with the fly bridge and you will be able to get under bridges that keep taller vessels out. 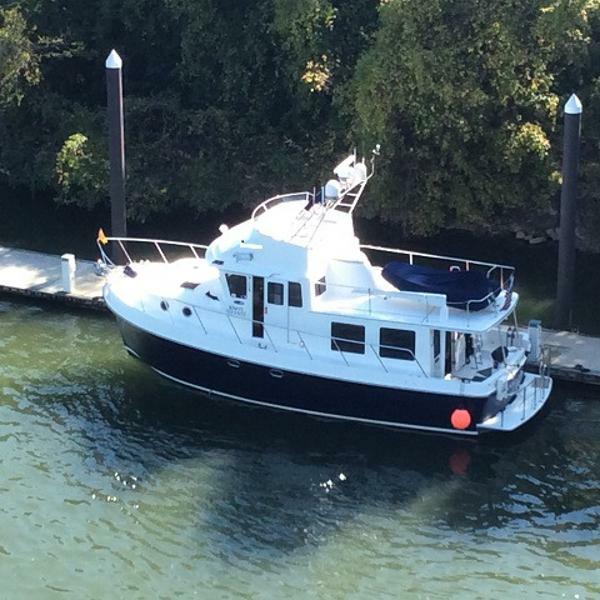 2008 American Tug 41 Trawler Knot So Fast is a 2008 41' American Tug flybridge trawler in excellent condition. She offers a 2 stateroom 2 head layout, beautiful Sapele wood interior, raised pilothouse, flybridge, single Volvo-Penta main engine, low-hour Northern Lights generator, bow & stern thrusters and a very nice electronics package. Knot So Fast has a hinged Radar arch, and she is a Great Loop veteran. 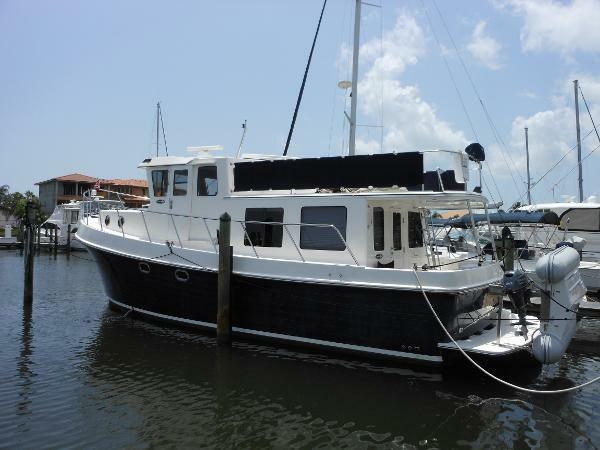 2005 American Tug 41 Pilothouse Trawler Red Dolphin is a 2005 41' American Tug pilothouse model in nice condition. 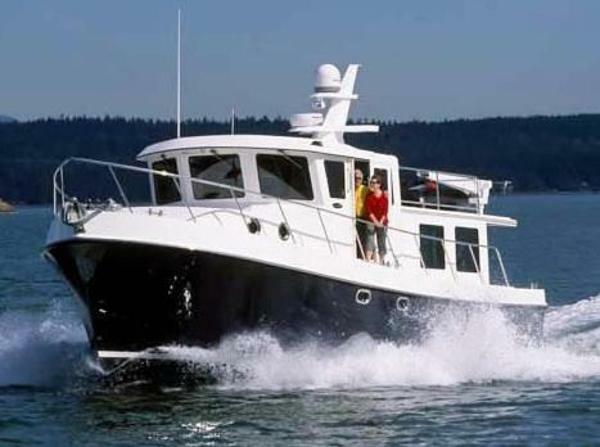 She offers a single Cummins main engine, 8 kW Northern Lights generator, bow and stern thrusters, 3,000 watt inverter, Yachtcontroller wireless control system and a clean, uncluttered interior. Her seller has completed his cruising and is downsizing, so Red Dolphin is now available for sale. Her 13'1" capable height makes her a terrific Great Loop candidate. 1955 American Tug 6-149 41' American TugLibbyThis boat was built in 1955, it has two GM-6-149 engines. It would be great for shifting in fleets, or it could be used for a dredging operation, such as a dredge tender.It has been used in the past for shifting boats and barges onto a dry dock. This boat has a extended wheel house for good visibility. Deck winches, and tall push knees.